Strategic alliance will see TPA expertise in section control and steering in AMAZONE equipment. 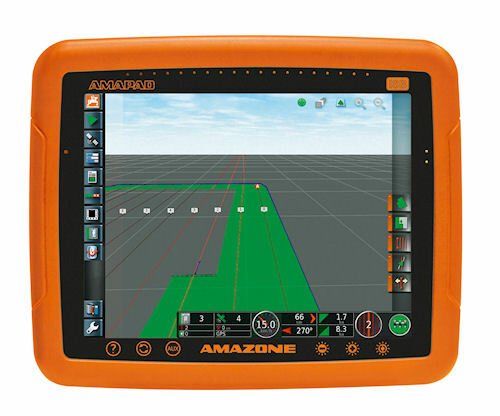 Topcon Precision Agriculture and AMAZONE Ltd. are partnering in an alliance that will see Topcon's expertise in variable rate technology and auto-steering included in AMAZONE's new AMAPAD touch-screen terminal. Driving the new product and collaboration is AMAZONE's AgApp (agricultural application) which allows third-party software to be loaded onto an operator terminal, which means the applications from independent developers can be fully integrated onto the console interface. This make only one sensor necessary, and that's where the AMAPAD ISOBUS terminal comes in. Topcon Precision Agriculture and AMAZONE Ltd. are partnering to combine their expertise in automatic steering systems for a range of professional farming solutions. Here, the new AMAPAD terminal will enable "mini views" of multiple displays on one touch-screen terminal. Topcon and AMAZONE's solution is a "mini-view" concept that allows applications which are not being actively operated, but which are being monitored, to be displayed in a small size at the side of a 12.1" multi-touch color screen. With this feature, the operator can select the application best suited for immediate needs at hand on any particular piece of farm equipment. ISOBUS operator terminal – The console can control all ISOBUS implements through one universal terminal. The Task Controller – Allows the exchange of data with software from an office PC via flash drives. All normal GPS applications are available by simply connecting to a suitable GPS receiver. GPS Switch Pro – This part-width section control forms the basis for many AgApps, such as AcuraSpray and AcuraSpread. Officials of both companies say the AMAPAD console can be easily integrated into any tractor. The equipment will be officially launched at the upcoming Agritechnica 2011 in Hanover, Germany, November 12-16.